Through photos, and many written words, come and share in this cooks food quest. ← What French Toast and Eggs Taught Me About Life. Have you and your friends/family quarreled over which version of a product on the market today is better? It would be harder to imagine not having the occasional tiff than not with the multitude of versions of food products out there. Such a debate sucked me in recently. I can take or leave a store bought instant pudding mix any day. They never seem to sit on the palate as well as the original thing. However I do not always want to play around with heating milk – or dealing with my old, occasionally temperamental friend – chocolate, as this occasion would have required. To once and for all settle the instant chocolate pudding debate it was decided upon that three brands would be purchased. Using the same carton of milk and blind taste testing system a group of us would taste and rate the pudding on several categories, finally tallying up the results and arriving at a designated winner. 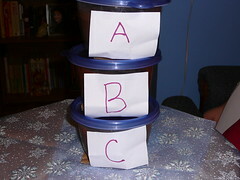 The three puddings chosen were Jell-O, Royal, and Wal-Mart’s Great Value. We purchase a brand new bottle of milk and returned home for the testing. 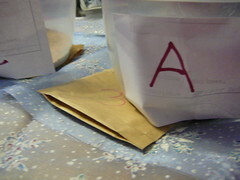 – One of us went into a room, opened up the packages and numbered the envelopes with the number 1, 2, or 3. After the envelopes were returned this person again left the room and another individual not knowing which number belonged to what product opened the envelopes and emptied them into an identical container which was marked A, B, or C – and then tapped the envelope number side up so no one could see the number. – The pudding was mixed in front of all so that everyone could rate the ease of preparation factor (since it was instant pudding we thought this to be an important factor). 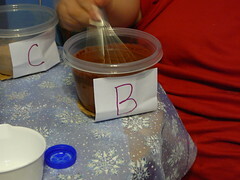 – Next the pudding was allowed to set and cool in the refrigerator while we made up ballots. – After the tasting was done each ballot was tallied and then combined to come up with the following results. 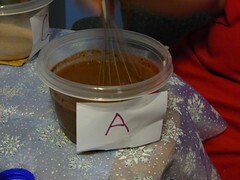 We all guessed that pudding A was the generic Wal-Mart brand. Most of us were wrong, however on which was Royal and which were Jell-O brand. The Wal-Mart pudding was a surprise to us because none of us picked it as our favorite in any category except ease of use. It blended together the quickest and set up the fastest garnering high numbers from all. The overall taste was sweet with no real discernable chocolate flavor. We wondered if we thought it was “chocolately” because we knew it was supposed to taste that way. The color was found to be a very plain and flat brown, but it was rated high in texture with creamy being a defining adjective used. 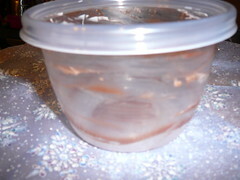 The Jell-O pudding after looking at the math came in last right behind the Wal-Mart based on its preparation issues. It took the longest to come together of all three, and since we were basing it on the “instant-ness” of the product it rated low on all ballots. However we believe that the extra whisking was a reason for the high numbers in texture with velvety being one of the adjectives used to describe it. The taste seemed to be where most people veered – you either loved it or did not. Some said it was a perfect blend of the sweet mixing with coco powder, hitting your tongue at the same time – while others felt that it was overall to strong with the coco powder and had the flavor of chocolate syrup right from the bottle. 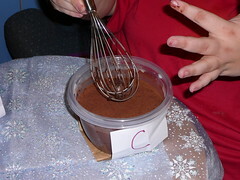 The Royal pudding won out because it could be viewed as easy to use falling in between the two in preparation speed – most likely also helping it with its texture that was described as silky. It was received the best in color and overall look by having a warm red tone mixed in. With flavor it seemed to be as split as the Jell-O only this time between people who enjoyed the mix of sweetness and coco powder and those who thought it was slightly too sweet. In the end did this end the great debate? Well you could say that. 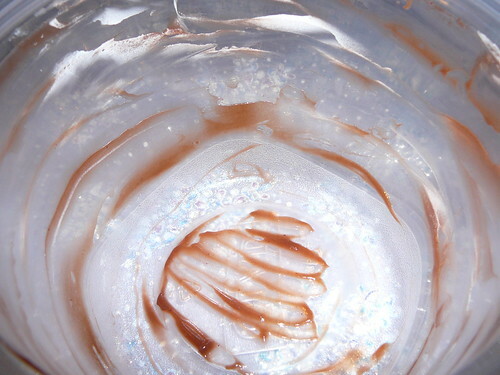 You see we each now know what our favorite instant chocolate pudding is and trust me we all enjoyed the pudding we liked best. Yet I’m sure that soon enough we’ll be trying to win each other over to “our” side of the pudding debate. What was my overall pick? Jell-O, and no matter what anyone says I’m sticking to it! We all enjoyed this so much that we want to make it a regular event. So if you have any thoughts on food you want taste tested let me know. 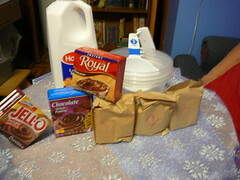 This entry was posted in chocolate, cooking, delicious, dessert, Food, Jell-O, Pudding, recipes, Royal, Wal-Mart. Bookmark the permalink. Very thorough testing! I loved reading this post and the last picture brought a big smile to my face. 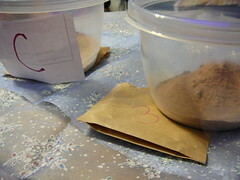 Thank you for the lovely comment at silkforum. Most often we have to get a meal on the table in the quickest and easiest way, but when we slow down long enough to think of who we’re preparing it for, the work of it becomes more pleasurable. I think the thorough testing comes from taking research and statistic classes for my degree at school. Plus it made it more fun, and trust me we were all surprised by the results. I’m glad you enjoyed reading the post and that you liked the picture. Once I got to the bottom of the bowl I just felt I had to share. I agree completely with you about slowing down and remembering to enjoy what we are doing and whom we are doing it for. You are welcome for the comment your post inspired it. I know this post is from 2007 – but it was extremely helpful to me while I was lamenting using Royal in place of Jello to make banana pudding for the masses (catering). What can I say? I’m a sucker for advertising and Bill Cosby told me it was the best. I’m using Royal. I can buy it in a larger portion. What French Toast and Eggs Taught Me About Life.